You scored as CPO Galen Tyrol. I just wanted to write another note of thanks and appreciation. In a year there have been 55000 page views on my 2 blogs, and over 27000 hits. I know that there are also many of you who read them through feeds, or through feed readers. Thank you for your support. Thanks for reading and please continue to do so. Also thanks for all of you who went and voted on my reviews on Amazon.com and Amazon.ca I am ranked in the top 1000 and top 10 respectively. I thank all of you who go and vote once I have posted a new review here; because you know they will be posted on the Amazon sites, I really appreciate it. I hope you continue to enjoy the reviews and keep an eye out, I have just started writing for another magazine and newspaper and those reviews should show up here, or link to them in the near future. This new Battlestar Galactica 2.5 DVD boxset release is full of special features and bonus material to attract all viewers. The split season format is great. It airs as half seasons on Sci-Fi and they release it to match its airing schedule and system. There are so many special features, you could spend more time watching them then the actual episodes. One of the greatest bonuses to the set is the much anticipated and greatly debated extended version of the episode ‘Pegasus’ this special version is over an hour and a half long it was not aired in this format due to time constraints. It views like a feature movie. It has amazing special effects and amazing cinematography. Other features include deleted scenes, which are broken down by episodes, include the producer's podcasts that aired on the Sci-Fi channel's website during the original airings, and the producer's video Logs and much much more. The deletes scenes are broken down episode by episode. The bonus material, if not ignored, will help viewers better understand the choices made in preparing the episodes and the season for release. This half of season 2 has many unique twits and turns in the plots and lives of the characters. We are also introduced to new human cylon models. As to the content itself, in this half of season 2 the central character is Sharon,with her actions developed alongside those of (spoiler alert!) those of a few different Cylon version of her. Byond Sharon’s development on Batlestar Galactica and Battlestar Pegasus, which is presented as strongly intertwined with the fate of the whole human race, a great deal of the season deals with relationships – Professional and otherwise – and especially friendships. Striking interactions occur between President Roslyn and Commander Adama; in the complicated relationship between Starbuck and Apollo; with Sharon and, well just about everybody. In the broader scheme of things, by this point in the series the complexities of guiding a free population while trying to avoid the Cylon army has taken it’s toll on both military and civilian leaders of this rag-tag group of humans trying to find a new home on a lost planet called Earth. The excellent character development in this half of the season can be attributed to very strong scriptwriting. The cliffhanger ending leaves you mouth watering and you desperately awaiting season 3 – which hopefully, after snagging this DVD set, you can finally get caught up in watching. 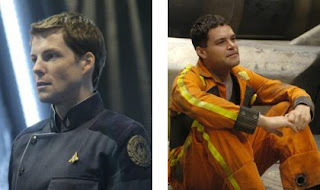 The Sci-Fi channel has to date released 4 of 10 web episodes that have story line development between season's 2 and 3. Season 3 begins airing in the US and Canada on October 7th for the first time the episodes will air in both countries at the same time. We here in Canada will not have to wait days, weeks or months for the US show to finally come to Canada. BSG is often called the best Sci-fi on television and Newsweek has gone so far as to call it the best drama on TV. With such high praise and the series consistently receiving great reviews – not to mention the special features and additions offered in the 2.5 DVD - how could this DVD box set not be worth every penny? Greetings again, it is once again time for me to share with you some of the resources I find very useful on the web. This time my focus is specifically Catholic resources, those sites that I find have a great resources or tools or function that makes them exceptional. The last time I reviewed 4 resources, 2 Author sites, and 2 resources sites. This time I am focusing on sites that for the most part I have discovered in the last year. The first three are collection sites - that is they collect and compile links and resources for you in one convenient place. 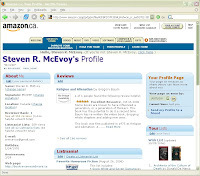 The last 3 are author sites. This is a site that allows you to create a custom home page with links to Catholic blogs, news sources, quotes of the day, prayer of the day and much much more. This site allows you to add your own links and creates a personalized site for you with what you want all on one convenient page. If you’re a blog reader, it lists the last 5 posts from any blog you add to the page. It is a great way to preview or skim a lot of blogs. This site allows you to customize the layout and even the color scheme to fit your tastes and preferences. You can even order the items in a section to your preferred layout. This is a site I just found today. Columnists are profiled, and links galore. 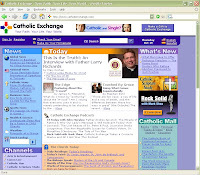 Broken into all kinds of categories, channels of different area’s of interest, community forums, a catholic mall with recommended resources, books and such and links to online stores, and links to most of the catholic publishers. It has a news section, and the top of the page profiles and highlights “today’s” new items. It is a nice clean crisp sight, vibrant colors and is available in both English or Spanish. 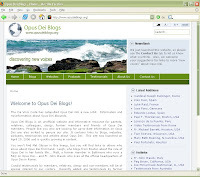 This is a very interesting site, in that it is neither specifically pro or con Opus Dei, it is a site that is a collection of links to sits, blogs, podcasts and other resources on the web both for and again opus dei. It is also multilingual it has sectio ns in Spanish, French, English, Portuguese, Italian, and Others. The main listing area’s are Blogs, Websites, Podcasts and Testimonials and each of these sections have sub sections. The blogs, websites, podcasts are sorted by their language the Testimonials are broken up by who wrote it; Members, Relatives, Former Members, Clergy and General messages. If you know a little or a lot about this group that has been the center of so much conflict and misunderstanding, this site will give you story’s of people who love it and have been changed for ever and people who hate it. Rev. Burke in his own words states: “The web offers a wonderful way of spreading information; also for persons like myself, whose writings happen to be s cattered over quite a number of fields. So, following the suggestion of a number of people (and with the indispensable technical help of Henry Kairo and my other webmasters) I am now putting most of them together on this web-site.” Many of his books are available here for free in a number of languages. Rev. 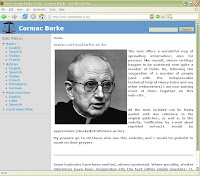 Burke was both a professor of modern languages and of Canon Law, here he has compiled most of his published writings, articles, books, and more. This site is a gem waiting to be studied and explored. There is a great deal here and it will challenge your tremendously. For those of you who read my blog regularly this will not be a new name to you. I have reviewed a number of his books over the last year and will continue to do so over the next number of months. 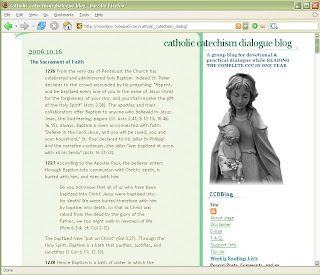 Dr. Hahn’s site had many resources for biblical studies, and links to acquire many of his lectures and conference talks and other resources, as well as a great collection of Catholic links. 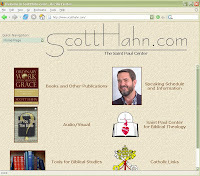 Hahn’s site may not be the prettiest to look at or even have changed much in a long time, but it has a great deal to offer in the links, resources, and biblical studies materials compiled in this one site. 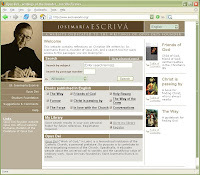 This site is dedicated to promoting the writings of St. Josemaria Escriva the founder of Opus Dei. There are many great things about this site, the complete works of St. Josemaria Escriva are available for free, all of his books published in his life and posthumously. These 9 volumes of the canon of his writings are available in their entirety. They can be read through from beginning to end, or skimmed from point to point. The greatest feature is you can search the entire collection, so it is like having an index to his complete works. The site is well laid out and presented in a clear manner. It also has many version of the covers of each book so as you view the site you can see some of the progression in the cover images and how they relate to the work. I hope that you found some of these resources helpful, and that they will help you in your journey. If you want to check out my previous article listing four resources, click here, and keep your eyes pealed for more articles to come in the future. 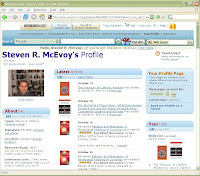 Just a quick aside I was planning on profiling another site: His Mercy, http://hismercy.ca/ it has a number of resources, a downloadable ebook of the Catechism, An electronic rosary, numerous Papal Encyclicals and more. But it was down recently and just went back up. Let me know what you find out there so we can share them with others. "There is no such thing as coincidence, just the illusion of coincidence! ... There is no certainty, only opportunity! ... This is the most important moment in your life... Commit to it! ... I, like god, do not play with dice and do not believe in coincidence!" I have embarked on a new venture, that of writing for another blog and being part of a team of bloggers. The blog is catholic catechism dialogue blog basically this is a group study blog with a team of writers who commit to writing at least once a months. We follow a reading plan and then discussion can take place. It will be interesting to see how it goes. 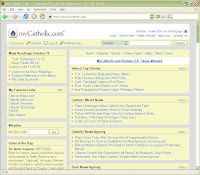 Last winter I wrote reviews of The Catechism of the Catholic Church, The Companion to the Catechism of the Catholic Church and Introduction to the Catechism of the Catholic Church by Pope Benedict XVI also to Handbook for Today’s Catholic Yet at that point I read quickly to write the reviews. I am looking forward to this adventure, this new venture that will be a challenge, and hopefully a tool to help me grow in my faith. So pop in and take a look from time to time, or join in the discussion. My only real regret so far is that I did not buy most of these in hardcover so they would have more durability. 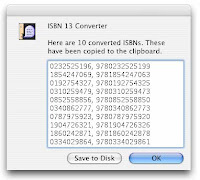 This is just a quick reminder that the International Standard Book Number, or ISBN is in the process of changing from a 10 digit number to a 13 digit number. So if your looking for a copy of an older book you might have trouble tracking it down once it has been reprinted. And it is not just as easy as adding a 3 digit preface. Most publishers have now gone to either the straight 13, or both 10 and 13 on the books. But any new books printed after January 1st 2006 will now have only 13 digit as the issuing agencies will no longer issue 10 digit ISBNs. Here is a link to a tool that will convert the ISBNs for you, that will help you convert then from 10/13 for you so that you can find the books you are looking for. Also just a side note there has yet to be a standardization for how to use the 13 you will find a lot of variations: ISBN13, ISBN 13 ISBN-13 or even just plain ISBN. Good luck and happy hunting for books and many hours of enjoyment in reading them. Some books are known to have influenced a generation, or a generation of thinkers. This book has the potential to do it a second time. 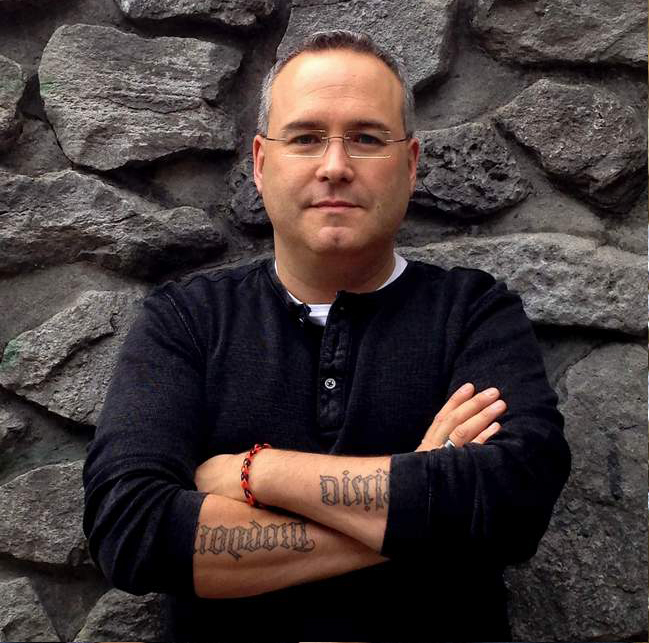 Baum has re-written the entire book, dropping whole chapters and adding new ones. This book was first published in 1975 as Religion and Alienation: A Theological Reading of Sociology and was immediately recognized as the seminal book on the continuing discussion between religion and sociology. This new edition will challenge a new generation of readers, thinkers, and students of either religion or sociology. This book is designed to help people encounter the gospel as a message of hope and liberation - a guidebook to help set us free from the prisons we have walled ourselves into, or that we have allowed society to place us into. UW’s own Scott Kline and David Seljak, who both teach at St. Jerome’s University (SJU), wrote the forward to this new edition and give the book high praise. Baum takes us on a journey through a series of progressive thoughts and areas of study to draw us forward into the study of religion and alienation. Baum looks at religion as both the source of alienation and as a product of alienation. He examines how alienation is also a product of the industrial society. Baum tackles the ambiguity that religion creates, both from a biblical perspective and from the perspective of the social sciences. Then he brings into the discussion the psychologists, with both Freud’s and Durkheim’s perspectives on symbolism. Those are but the beginnings of Baum’s work on this diverse topic. A book launch can be a fascinating event. I have witnessed book launches that were merely reading excerpts from the book and signing copies, to live choral pieces composed just for the event with media from around the world. You never know what you will find at a book launch until you are at the event. This new book is being launched here at SJU on October 20th at 7:30 p.m. Baum will be giving a lecture on Christian Muslim Dialogues in a Post 9/11 World at Siegfried Hall. This event will be a book launch and lecture, followed by signings of the book. Baum’s Lecture at SJU last January on the same topic had the highest attendance of any of last year’s Lecture Series at SJU. This, even with the controversy over Pope Benedict XVI’s comments, will be even more significant. So come find out what Baum has to say on this topic and attend the book launch for this new work. This book will be an excellent addition to any religious thinker’s library. It was thirty years in the making and time has only made it better. Even if you read only the last chapter on the five reasons that theologians should engage in dialogue with social thinkers, it will make the book worth the changes. 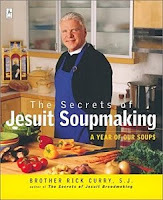 The Secrets of Jesuit Soupmaking: A Year of Our Soups by: Brother Rick Curry S.J. “There is something so comforting about soup. It touches something deeply rooted in our lives.” p. 5. This book is a journey around the world and through the year. The soups are divided into church seasons: Advent, Christmas, Lent, and Easter. It is filled with interesting stories and anecdotes from Curry’s travels and from Jesuit history and lore. The recipes are great and the tales make them nourishing for the soul as well as the body. With soups from around the world and tales of travels, life, loss and joy, the book will be a pleasure to read. Savor the words of wisdom as you enjoy the soups. Rick Curry entered the Society of Jesus in 1961. In the last forty years he has been an actor, baker, teacher and author. He founded the National Theatre Workshop of the Handicapped, a nonprofit acting school for persons with disabilities. With both a masters and doctorate in arts, he has created the first residential center for arts for persons with disabilities. What I love most about this book, is how the author opens up to us, his life, travels and his religious order Te Society of Jesus or, as they are more commonly known, Jesuits. Curry shares stories about the Jesuit community, but he also makes the distinction between myth and truth; he quotes a brother Jesuit John Courtney Murray who stated: “A myth is that which never happened, but is forever true.” In this book he tries to capture that spirit with both the soups and the stories. He tries to capture the learning and memory of Jesuits around the world. Nice thing about the recipes, they are all accessible. There is nothing worse than picking up a cookbook and having to find out what the ingredients are and traveling all over to track them down. These recipes do not fall into that category; any student could find the items at the local grocery store. The meals are easy to prepare, and with such a great variety, could give you a new soup a week for more than a year. Many of the soups also offer variations for even greater variety. For example, there is a recipe for basic Chowder that has variations for Clam, Crab or Corn. In comparison to Soup Crazy, a cookbook by What’s for Dinner? Host Ken Kostick, all of these recipes are accessible to the average student’s kitchen. You won’t need special pots or utensils, or a dictionary to figure out what the instructions mean. This book will help keep you warm in body and in spirit. It would be a great addition to a student’s kitchen or even any soup-lover’s bookshelf. Pick it up and give some of the soups a try - your stomach will thank you. 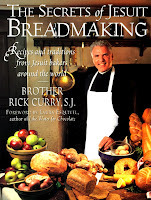 If you want a real challenge he also wrote a book called Secrets of Jesuit Breadmaking, and what could be better than homemade bread and soup for supper on a cold fall evening. Pilgrimage and Exile: Mother Marianne of Molokai by: Sister Mary Laurence Hanley, O.S.F. Sister Mary Laurence Hanley, O.S.F. This is the amazing story of a woman who helped to shape health care in Hawaii and lead a group of missionaries to serve in hospitals and leper colonies half way around the world from home. I was first introduced to Mother Marianne in the film Moloka,i which was primarily the story of Father Damien, and his service among the lepers on the island of exile called Molokai. This story overlaps with that one for many years but from very different perspectives. This biography is a delight if somewhat difficult read. It draws heavily upon source documents from the period of Mother Marianne’s life, 1838-1918. It has been said that our life will be measured by the -“ the dash”, what we do with the years between our birth and our death. Marianne made the most of those years; in fact she lived and gave, and served enough for a few lifetimes of lesser people. Born in Witzenbacher in 1938, her family emigrated to Utica, New York when she was just 2 years old. In 1862 Barbara Koob professed orders to become a nun. She established and expanded hospitals and medical services first in Utica and then Syracuse New York. The first hospital in Syracuse opened in 1869 and mother Marianne was in charge from 1970 to 1877. In 1877 she rose to the position of Provincial Mother of the Sisters of St. Francis of Syracuse. It was in that position that she received the request to come and serve in Hawaii, in the role of establishing the hospitals and overseeing medical care on the islands in the Kingdom of Hawaii (At that time often referred to as the Sandwich Islands). The islanders in Hawaii immediately recognized a strength of character - the internal life of Mother Marianne. She was a favored friend of Queen Kapiolani and King Kalakaua both of whom, though Presbyterian, gave to the work of Mother Marianne and met with her personally on many occasions. Mother Marianne had to use all of her skills to make the mission on Hawaii work; she had to contend with Parliament, Business owners (tax payers who did not like spending money on lepers), and with the personalities in the church, and her own order. Marianne not only revolutionized how the patients in the leper hospital, and eventually on Molokai, were treated and cared for. She set up and oversaw hospitals on many of the islands. Marianne said on more than one occasion that: “God has called us for this work. If we are prudent in our duty He will protect us.” And she was right - not one of the scores of nuns who served there for many long years. This book will challenge you! You will see service to other people as the greatest calling and the greatest gift. You will witness the life of an amazing woman who cared for all who came into her circle and did all she could to help them be better men and women.